If you are in Siem Reap pass by the Hotel Victoria, right in the heart of Siem Reap, where you can see and buy KILT jewellery. The Hotel is situated in a splendid venue, overlooking the Royal Park. 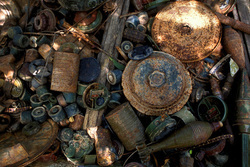 The Cambodian Landmine Museum Relief Facility (CLMMRF) is the place where Bel's destiny changed. Bel was taken in by Mr. Aki Ra, the founder of this NGO, who provided him with an education and a new outlook on life. Visit the Museum and take a look at some of KILT's jewellery on sale at the shop.